Jihad Watch : There appears to be a very deep hostility to Christianity among certain officials of the UK Home Office. The Home Office is facing more questions about its attitude towards Christian asylum seekers amid claims it rejected another Iranian man’s application to move to Britain by telling him, ‘your belief in Jesus is half-hearted’. 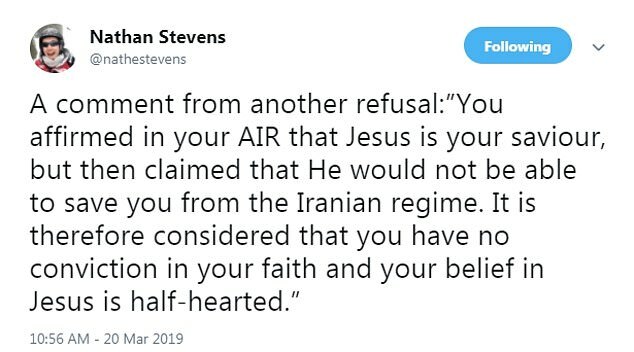 Now immigration caseworker Nathan Stevens, who exposed the first case, has said another Iranian he worked with had his application rejected after an official criticised him for admitting Jesus could not protect him from his country’s tyrannical regime.